Like many historic cities, Aviles has evolved over the centuries and it now has an established and well-defined old quarter in the heart of the city. Today it is this old district that attracts the majority of tourists and it is in this part of the city that most of Aviles' sightseeing treasures lay. 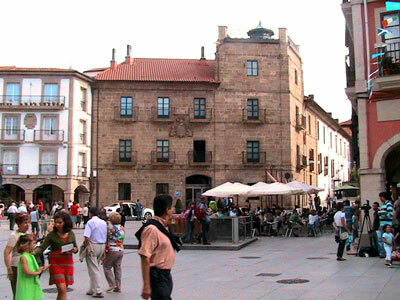 The old town of Aviles is comprised of a number of squares and plazas along with a collection of streets, many several hundred years old, that connect and navigate between one another. By following a path along these streets it is possible to take a complete tour of the town whilst taking in nearly all of its architectural heritage. 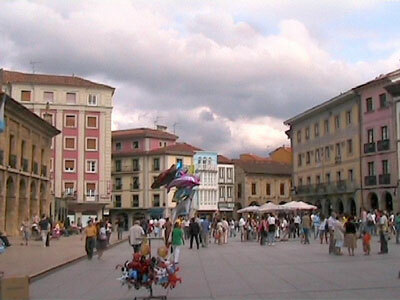 One of the main focal points of Aviles is the "Plaza de Espana" from which many of the city's oldest streets originate. Many important Spanish cities have a plaza de Espana and Avilies stays true to the theme. The plaza de Espana is not actually located where a visitor would initially enter the city, however it is an ideal starting point from which to head out and see the old quarter and it is therefore the point to which many tourist precede in order to start their city exploration. 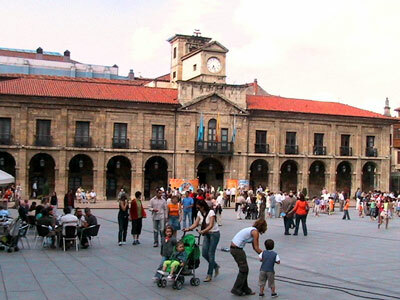 The Espana square is overlooked by the main council office in the form of the "Palacio Municipal" (Municipal Palace). This building dates from the seventeenth century and possesses a small clock tower that presides over the plaza without dominating it. The construction of this two storey "palace" is in a light coloured sandstone with colonnaded arches at ground level and small windows, surrounded by cast iron balconies, at its first floor level. Elsewhere on this square there are a number of terraced manor houses, most of four storeys in height and all having arched stone passageways beneath them. These former houses of the “well to do” keep the square colourful with their white, yellow and pink facades. To one end of the plaza de Espana sits another of Aviles oldest buildings, the Palacio de Ferrera. Built in the sixteen hundreds, this stone structure occupies a corner plot that leads off the square and down "la calle de San Francisco" (Saint Francis street) - a source of more historic exploration. The Ferrera palace is slightly dour to look at, although it does have a large Masonic coat of arms and is bordered by several much lighter buildings. In the central area of the plaza de Espana there is some benched seating, but the seats and chairs of numerous cafes also spill out onto the large paved area making it highly sociable. The plaza de Espana is a large and airy space and, as its name suggests, it is the most important of Aviles inner city courtyards. 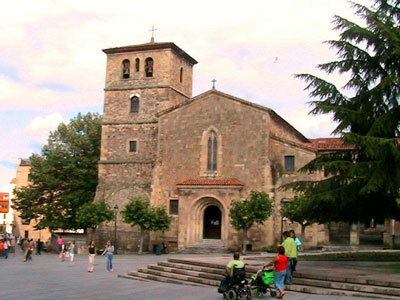 It is also a good point from which to start and complete a tour of Aviles. This square makes a natural meeting point and it is genuinely stunning both during the day and when illuminated at night. It has a number of bars and cafes, is an ideal place to take a rest bite from sightseeing and it is also used during fiestas and other civic events. Within the old town of Aviles there are several streets and districts that are worthy of mention for their diversity of building design and their role in the town's historic development. Each one of these zones has its own character, but they all combine to add to the ambience and atmosphere of the old quarter. Below is a summary of one of these areas and you will find more on our "Aviles old town pages 2 and 3 (accessable from the index box towards the top right of the page. The streets of “Galiana” and “San Francisco” both ultimately lead to the plaza de Espana and are now completely pedestrianized. On them you find an old church, the "Iglesia San Nicolas de Bari", the elegant and highly ornate Palacio de Balsera and a number of other colourful and interesting buildings. These buildings vary from old stone properties, built in the medieval period and supported on arched colonnades, to the more colourful properties of the late eighteenth and early nineteenth centuries. These latter buildings have decorative window surrounds and pretty balconies and are washed in pinks and oranges. All told they make quite a spectacle. This particular area is undoubtedly one of Aviles most attractive and the mix of building styles and colours continually gets any tourists' attention. The Nicolas de Bari church has its own small courtyard and below this there is a decorative water feature comprising a number of heads, each projecting spouts of water from the mouth. This is typical of the kind of detail and eccentricity that is found in Aviles and it makes the old quarter a place of constant surprises. 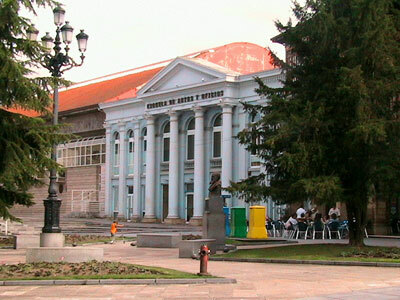 At the junction of "Galiana Street" and "San Francisco Street" there is the "Casa Municipal de Culture" building with a small landscaped area in front of it. Attached to this building there is a large outdoor café which looks back down and towards the old town centre and where many tourist choose to take a break. Beyond this point the old town runs into the new and most tourists choose to conserve their time by returning down a different route to the historic quarter. The Galiana Street and San Francisco Street area is definitely one of the most attractive parts of town and its mix of light stone and bright dashes of colour act to set Aviles apart from the rest of Asturias.